More than 600 finance professionals registered to attend the London Revolution. An excellent group of top finance professionals shared their latest research and experience with big data and machine learning. 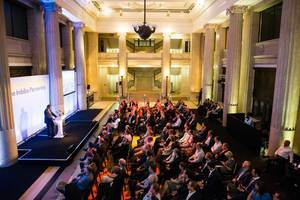 The event took place on April 24, 2018 at the Banking Hall, one of the most exquisite venues in Central London. Speakers included top buy and sell-side professionals, as well as high profile academics. They covered the most promising areas of machine learning and AI in finance, what’s real and what’s hype, as well as many real world examples of how alternative data is adding value to the investment process. It was a full day event with several standalone speaking sessions, a few lightning talks, a machine learning panel and a panel on alternative data. Armando sets the stage and highlights why we have entered a big data and machine learning revolution. Nitish focused on the similarities and differences between quantitative and discretionary investing with an emphasis on the importance of data. He will also host a demonstration of quantitative alpha using a web based simulator. In order to maintain an edge in the marketplace, asset managers are to a larger extend turning to unstructured content for alpha creation, using NLP and text analysis techniques. In addition, more and more managers are expanding their mandate, trading global portfolios, to ensure more scalable strategies. As part of his presentation, Peter showcases how news sentiment can be a valuable input to such process. Straight talk about AI and Big Data: What is real? What is marketing hype? Artificial Intelligence (AI) is rapidly moving from a mesmeric technology to a powerful teammate and a foundation for consumer and business decision making. However, AI is a young field full of amazing potential. It’s mystery and lack of understanding is also allowing for hype to grow unchecked. Unrealistic claims of an "AI singularity" and portrayals of an "AI apocalypse" are creating a hype machine that is unparalleled in recent history. The reality is somewhere in between these two extreme scenarios. This session focuses on some of the good practices around practical and high value applications of data and AI across healthcare, insurance, financial services, and digital commerce. Asger covers forecasting of Chinese macroeconomic time series using a large number of prediction variables. He investigates what is the extent of improvement of forecasts when news sentiment indexes are included among the predictors. The results suggest that forecasts obtained with this method outperform univariate autoregressions and in shorter prediction horizon news indexes improve the forecasts. Successful market timing is a tantalizing holy grail for investors. On both side, investors and researchers have discovered that the market timing is harder than it might seems. At Next Gate Capital they think that this is a perfect research playground for new machine intelligence techniques and new alternative dataset. They use classic variables to build economic climate and global sentiment indicators, enhanced with news sentiments, particularly on politics and monetary policy (two fields very difficult to handle with classic dataset) and economy. They cover a practical example of enhancement of a trend following strategy. The financial sector is making a massive shift towards big data and machine learning technologies. Panelists will share their experience in using data science and domain expertise in understanding data context.They will address how machine learning can be useful in creating new alpha signals, as well as in the data generation/preparation process, in portfolio construction or risk management. J.P. Morgan use two examples to demonstrate how big data and machine learning can add value to systematic strategies. The first strategy is on equity mean-reversion in Japan, where they find that news volume and news sentiment can be a useful overlay due to behavioral bias. The second example covers a Global value strategy based on Machine Learning algorithms. They show that Machine Learning models can outperform simple linear benchmarks, and news sentiment could further enhance the strategy. Practitioner’s point of view on what in big data and machine learning investing is challenging and what to do about it. Demystifying the “magic box”, sharing best practices and real-life examples of machine learning application to investing including NLP with RavenPack. Machine Learning - Next Steps for Finance? This talk reviews recent academic literature that attempts to ensure causation rather than correlation in the use of machine learning. Applications of ML in Genome/Cancer research have recognized this critical issue for some time and the case is obviously equally strong in Finance where money may be allocated on the basis of completely spurious data driven models. We look at developments in "Post Model Selective Inference" and "Counter-factual Causal Prediction" with examples. We also discuss recent statistical literature that questions the notion of "Big" data where the value of incremental data may tend to zero and how inference should be adapted. Combining alternative news and sentiment data with traditional signals can provide increased risk-adjusted returns in long/short equity portfolios. In this presentation we consider the application of Machine Learning techniques to capture these effects and explore non-linear approaches to alternative data. Do factors perform differently under news driven sentiment? Using Style Research and RavenPack sentiment data, Louis constructs regional factors and sentiment indices in the spirit of Hafez and Xie 2016. Results show strong differences under periods of high and low sentiment. The design of a quarterly moving average is distinct from most findings that reveal intra-day to a few days efficacy for sentiment. In particular, a strong difference in underlying distribution of factor returns is revealed and the Sortino ratios are distinct under sentiment regimes. Lightning talk: Facebook has recently come under significant scrutiny from customers, the press, and US Congress about how it allowed firms to siphon personal information from millions of user accounts. While this case is interesting in its own right, it highlights a number of lessons for vendors and users of alternative data about the risks of selling or using data that could provide personally identifiable information.This presentation discusses these risks and the steps firms should take to mitigate these risks. Lightning talk: RavenPack automatically detects thousands of different types of market moving events in unstructured text documents. An enriched event captures more context from the document to provide more color about what the event means. We take a quick look at how events are detected now and what innovations are happening to help enrich the events the system can detect moving forward. Lightning talk: Dan discusses alternative data integration on the buy-side, with an emphasis on quantifying strategy. He's highlighting how nearly 50 fundamental investors are actively building these efforts and are approaching alternative data from a talent, infrastructure and resourcing perspective. He also covers the data science landscape across investment managers. Panel: How to avoid the Alternative Data Pitfalls? This panel addresses what key areas financial institutions should have in mind when looking at alternative data to avoid wasting resources on alternative datasets doomed not to provide value. Panelists will share their experience highlighting what pitfalls they should try to avoid as quant or fundamental investors, and how to be successful with alternative data. They will also discuss what attributes are required of a potentially performing alternative dataset. Nitish specializes in building the trading and business strategy for WorldQuant’s Virtual Research Center. He is also involved in setting up the research environment for WorldQuant’s new offices and building collaborations with academia for the firm and has gained exposure to a variety of areas, including risk, consulting, business development, quantitative research and trading. Copenhagen Economics / Aarhus Univ. Asger is an expert in econometric modelling and data analysis. He is associate editor of The Journal of Business and Economic Statistics and The Journal of Financial Econometrics. In 2014 Asger was featured on Thomson Reuters' list of the World’s Most Influential Scientific Minds. Dan leads Jefferies’ Data Strategy effort, he's been at the firm for 10 years and is a member of the Distribution Committee. His career began in investment banking, focusing on leveraged finance at Merrill Lynch before joining the tech banking team at Credit Suisse First Boston. Ada is a quantitative researcher on systematic cross asset strategies within the Global Quantitative and Derivatives Strategy team at J.P. Morgan. Morgan is the CEO of FinTech start-up CloudQuant.com, a cloud-based investment strategy research tool and incubator. He also serves as Chief Investment Officer of CloudQuant Capital Management LLC and Head of Global Systematic Trading for Kershner Trading Group. Schonfeld Strategic Techworx is the technology servicing arm for Schonfeld, a multi-manager platform for quantitative, fundamental equity and tactical trading strategies. At Schonfeld, Rich is responsible for the market data sourcing function as well as the technology for the research environment. Andrej is the co-founder of Data Capital Management; a systematic Hedge Fund based on machine learning technologies and “Big Data” feeds. Andrej is a mathematician and a fundamental investor by training, who is passionate about technology and the onset of the “Data Economy”. Currently teaching Applied Asset Management on the MPhil. Economics and Finance at Cambridge Univ., he is also a Visiting Professor at Imperial College and Director of Research in High Frequency Trading in the Centre for Advanced Financial Engineering, and an advisor to Old Mutual. Manoj is also the founding Managing Director of The Entrepreneurs’ Fund IV, a $100M seed fund focused exclusively on cognitive computing. Most recently, Manoj was General Manager of IBM Watson, where his team built the first cognitive systems for healthcare, retail, and financial services. At Kiema Louis is incubating strategy ideas, and collaborating on research. He has worked at Northfield, Panagora and then Citigroup Asset Management before moving to London and Old Mutual where he continued the dual roles of senior portfolio manager and quantitative research. He then served as Head of FactSet's Risk and Quantitative Research. BAM is specialising in quant strategies employing the latest Machine Learning technologies across multiple global markets & asset classes. Prior to founding BAM, Richard worked at $80bn Man Group as Head of Dimension, AHL’s multi-strategy systematic fund, including the award winning Evolution fund. Prior to founding Estimize, Leigh ran Surfview Capital, a New York based quantitative investment management firm trading medium frequency momentum strategies. He was also an early member of the team at StockTwits where he worked on product and business development. Mike is a leading expert on the investment research industry. In addition to founding Integrity Research, Mike is on the board of directors of Investorside Research Association, the non-profit trade association for the independent research industry, and a recognized speaker in his field. Prior to co-founding Next Gate Capital, Dimitri worked in the investment division of UBS as an Investment Advisor involved on quantitative Strategy. Before that he worked in the Data department at UBS Hong‐Kong focusing on digitalization. Jason is responsible for the design and implementation of the RavenPack software platform. He is a hands-on technology leader, with a consistent record of delivering break-through products. A cocktail reception will be held at the conference venue from 5:00 pm. The event is free to attend for financial professionals with an invitation. 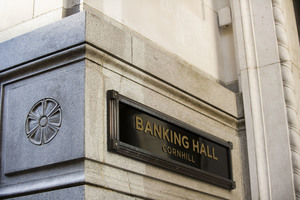 The Banking Hall is a prestigious meeting and conference venue in Central London. The Grade II listed Main Hall was designed in the 1930s and has a unique Art Deco charm. The Mezzanine level looks out over the Bank of England. A perfect location in the heart of the city with one of the best catering in London. More than 600 finance professionals registered to attend the London Revolution. An excellent group of top finance professionals shared their latest research and experience with big data and machine learning. 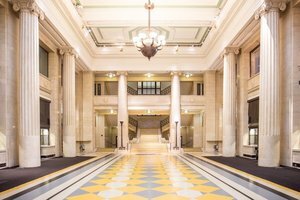 The event took place on April 24, 2018 at the Banking Hall, one of the most exquisite venues in Central London. In case you weren't able to attend, presentation slides and video recordings have now been made available. The financial sector is making a massive shift towards machine intelligence in capital markets. Panelists share their experience in using data science and domain expertise in understanding data context. They will address how machine Intelligence in Capital Markets can be useful in creating new alpha signals, as well as in the data generation/preparation process, in portfolio construction or risk management.